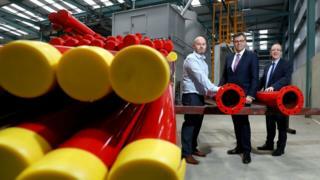 A Strabane manufacturing firm is creating 83 jobs in a £7m expansion. Fabplus makes prefabricated pipe work for use in fire sprinkler systems fitted in hospitals, factories and apartments throughout Britain and Ireland. According to Invest NI, the new jobs will add £1.7m in salaries to the local economy and take employment at the firm to 138 people. It is providing £786,000 in grant aid. The company is hoping to gain a foothold in markets in mainland Europe and Scandinavia. Fabplus director Darren McGavigan said: "This is an ambitious expansion plan designed to move our operations to a scale which can compete in the global marketplace." Fabplus is a subsidiary of Mechanical Pipework Fabrication Limited (MPF), based in Lifford in the Republic of Ireland. The new jobs will be created over the next three years.